Things got real weird in Miami at the end of Bears-Dolphins. After a scoreless first half, Chicago roared back with three touchdowns in the third quarter. It seemed like the Brock Osweiler-led Dolphins were toast, but Albert Wilson forced overtime with a pair of long catch-and-run touchdowns, boosting Osweiler’s stats in the process. In overtime, the Dolphins trudged their way up the field, and Frank Gore gave them first-and-goal at the seven with a huge run. 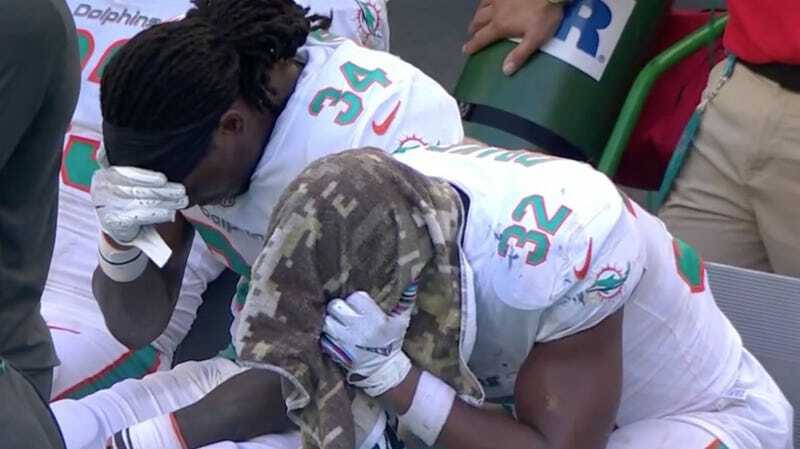 Kenyan Drake got the rock with the Dolphins just half a yard away from the win on third down, only to fumble it into the end zone when Akiem Hicks wrestled it away. Drake was devastated, and he held his head in his towel for a few minutes. The Bears then had a chance to win, which they blew when conservative play-calling set Cody Parkey up for a game-winning 53-yard kick. It went wide right, and Miami was gifted a second chance. They too played it safe, but they got a little closer than Chicago did, and Jason Sanders was perfect from 47 yards to win it for the Dolphins right as time expired. Drake got back in the towel (a different one), but he was overcome by happiness this time. The only way this could have been more emotionally tumultuous for Drake would be if he had scored the game-winner himself.